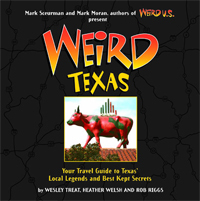 Way out in the almost interminably horizontal stretches of West Texas lies Wink, a tranquil burg that's home to a quiet, close-knit community. Here, the streets are clean, the people are friendly and life is good. There is, however, one problem. Wink suffers from a severe depression… or more accurately, severe depressions. On the morning of June 3, 1980, a contractor was out performing an inspection for one of the local oil companies. He was checking pipelines just north of town when he noticed a peculiar splash nearby. Curious as to what kind of splashing would go on in a flat, dusty field, he walked toward it and discovered a 20-foot-wide hole where, oddly, there hadn't been one before. The hole, which descended four stories to a restless cauldron of water, grew within two hours to a diameter of 100 feet. By noon, its width doubled. The earth was caving in at an absurd pace, just a few hundred yards from Highway 115 in one direction and a field of oil-storage tanks in the other. 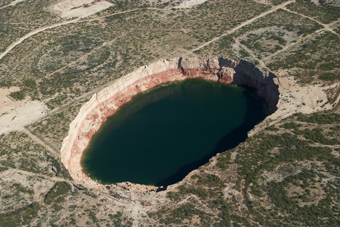 By the next day, the sinkhole had opened to some 350 feet. Chunks of earth crumbled into the hole for several weeks and the southern rim continued to subside and fracture for months. The most dramatic damage, however, occurred in those first 24 hours. Luckily, formation of the cavity slowed before it threatened either the highway or the storage tanks. No one was injured, either, though the hole did swallow a water line and a utility pole before it was done. As time passed, the opening appeared to stabilize. The mysterious crater that suddenly emerged less than three miles from the center of town became less worrisome. After 20 years, it seemed as though the hole, which the locals had nicknamed the Wink Sink, was just a freak occurrence. Then it happened again. In May of 2002, a second crater punctured the surface, this time only a mile and a half from town. Dubbed Wink Sink 2, the new hole started out as large as its predecessor had ended and it was already twice as deep. By the end of June, it had enlarged to approximately 600 feet by 750 feet, growing at a rate of roughly 10 feet a day. It has continued to expand ever since, swallowing fences put up around it at least twice. Opinions and theories as to the cause of Wink's spontaneous collapse are numerous. The area has seen continuous oil extraction since the late 1920s, so people initially thought drillers might simply be taking out too much. Not only oil, but millions of gallons of brine have been displaced over the years, which triggered images of large, empty pockets below the surface, though that's not really how it works. 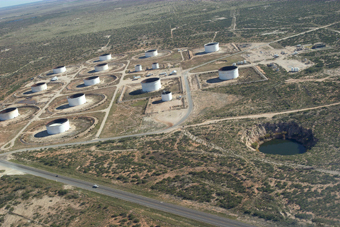 A few believe it's somehow connected to Carlsbad Caverns, less than 100 miles to the northwest. It's an idea that's occasionally tossed about by some of the locals, though nobody seems very sure just exactly how it's connected and the supposition is usually prefaced with "You know, they say…"
Now more than 750 feet wide and 1,000 feet long, Wink Sink 2 is large enough to consume several blocks of downtown Wink, taking with it City Hall, Winkler County Park and Wink's treasured Roy Orbison Museum. And it looks as though the dilation isn't over. Of course, it's highly unlikely the second sinkhole would ever reach the town's roadways, but that's not to say Wink Sink 3 won't make an appearance. One good dissolution of the right evaporite sequence and Wink just might vanish as quick as its name.